Costa Rica’s best zip line experience! Want to experience the best, longest, fastest, highest, safest and most amazing zip line in Costa Rica? Here is all you need to know about Costa Rica’s best Zip Line. Diamante’s Zip Line course is Costa Rica’s best and only ocean view dual Zip Line. The course offers dual lines so you can share this experience with your family and friends, riding side by side. The course is considered best in class and known for its soaring lines that deliver guests extremely long ride times. Diamante Eco Adventure Park is located on Matapalo Beach overlooking the Gulf of Papagayo in Guanacaste. It is 20 minutes driving distance from Playas Del Coco, Playa Ocotal, and Playa Hermosa; also about 40 minutes away from Papagayo Peninsula, the beaches of Potrero and Flamingo and Las Catalinas. Tamarindo is just one hour South of Diamante. It is located right next door to the RIU Hotel and is within walking distance. Ask Diamante about their shuttle schedules and transportation options. If you have a rental car Diamante is well marked and easy to find with ample parking. Dual-Action Superman Line at Diamante Eco Adventure Park. Restrictions: There is a minimum and maximum weight requirement for the zip line tour. The minimum weight is 40 kilos (85 lbs) and maximum 130 kilos (285 lbs). There is also an option for kids to do the shorter lines but they still need to weight at least 27 kilos. What to bring: Comfortable clothes, closed toe shoes, hat or ball cap, sunblock, and an amazing adventure attitude! 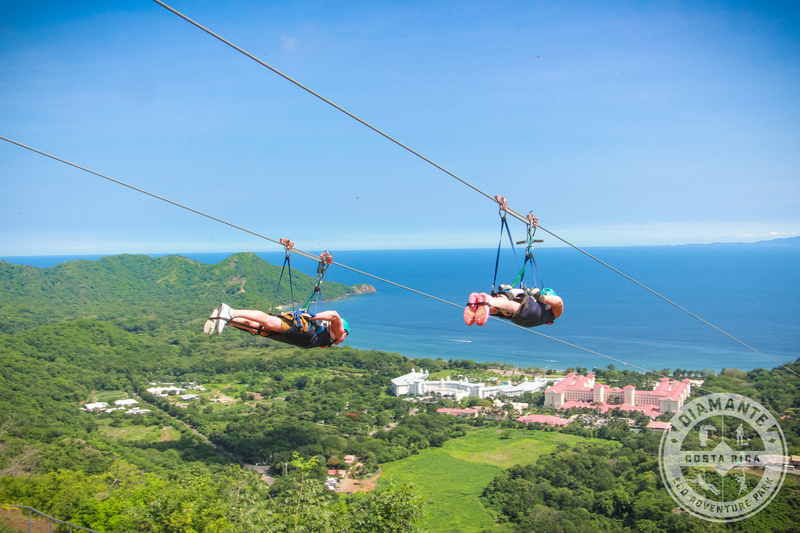 Tour Times: The zip line runs every 30 minutes starting at 9:00 am. Afternoon*: 1:00pm, 1:30pm, 2:00pm, 2:30pm, 3:00pm, and 3:30pm. Visit the Best Zip line Park in Costa Rica. Located in Guanacaste, Costa Rica. Diamante’s convenient oceanfront location offers the most unique and best zip line course featuring the longest dual-line in the country. Diamante is also home to a renowned Animal Sanctuary and also offers horseback riding and ATV tours. Diamante delivers world-class fun in an amazing setting. Discovery Pass ($42): Enter our Animal Sanctuary and meet our wildlife family: Lucy the sloth, Nico & Sama the jaguars and Balu the white faced monkey! The Butterfly observatory and bird aviary are also customer favorites. Aerial Pass ($78): Enjoy the zip line tour, including the Superman Man mile-long dual cable and a 30 foot high controlled descent called a Quick Jump. Adventure Pass ($118): experience the full zip line tour plus one extra cable that runs through our animal sanctuary and a hanging bridge over the crocodiles! Finish the tour walking through our world-class animal sanctuary and enjoy our wildlife family. This pass also includes a buffet lunch at the Ocean View Welcome Center and access to our beach activities (stand up paddle board, snorkeling, kayak) and our awesome hammocks. Call us at +506 2105-5200 or email at [email protected] for more information!